On Saturday(December 9th) the premiere of 'Star Wars: The Last Jedi' took place at The Shrine Auditorium in LA. To see all of the celeb looks, click HERE and continue below for the wrap-up. Cobie Smulders bared her midriff in EMILIA WICKSTEAD FALL 2017 'Rebecca' black & white puffy sleeve lace embroidered crop top and the matching 'Mercia' high waist flare skirt. Side parted waves, a box clutch and black ankle strap sandals finished up her look. Dita Von Teese turned to one of her go to designers, JEAN PAUL GAULTIER. Her FALL 2017 COUTURE black velvet hooded gown featured contrasting gold beaded trimmings. The burlesque star also accessorized with the jewelry from the same runway look. Her signature beauty look and a black clutch finished up her look. Storm Reid stepped out in a ROSETTA GETTY RESORT 2018 ivory long vest with the matching culottes and a black WOLFORD bodysuit underneath. The young starlet topped off her look with a braided hairstyle, JENNIFER FISHER earrings and VIA SPIGA sandals. Gwendoline Christie was a standout in a custom GUCCI shimmery long sleeve floor length dress with a sultry thigh-high split detail. While I don't favor her shoe choice she still looked great. 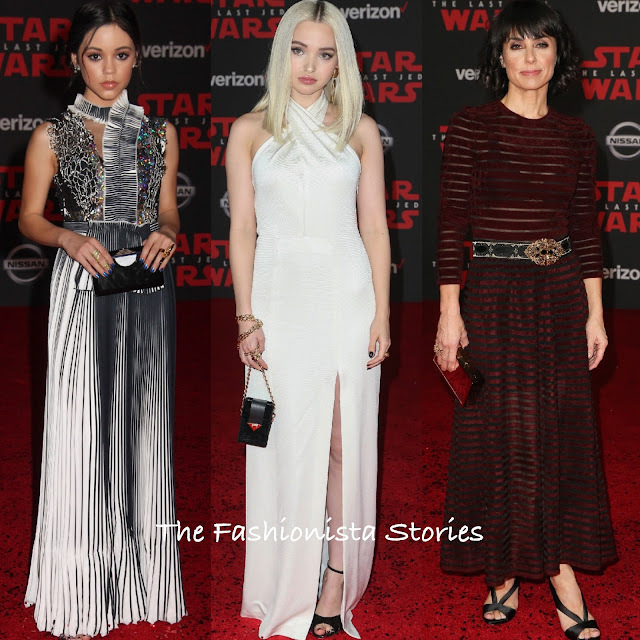 Sofia Carson wore a GIAMBATTISTA VALLI black floor length gown with a crisscross detail bodice, a cutout & bow detail waist and a pleated silk-chiffon skirt. The young starlet dressed up her look with BUTANI earrings and a LE VIAN necklace. A complimentary beauty look finished up her look. Billie Lourd also shined in a sleeveless silver TOM FORD chainmail floor sweeping dress. My only quibble is that I don't like her silver metallic square toe pumps that she is wearing. However they are not visible so it doesn't hurt her look. A braided up-do finished up her look. Jenna Ortega wore a GOSIA BACZYNSKA FALL 2016 pleated stripe & beaded embroidered, sheer panel gown which she accessorized with a black clutch and a complimentary beauty look. Dove Cameron wore the GALVAN SPRING 2017 ‘Flyover' dress halter dress with a crisscross strap neckline and a split detail. Dove looks pretty but the black accessories were a safe, predictable choice. Colored velvet sandals would have looked great with this dress. Constance Zimmer wore a RONNY KOBO HOLIDAY 2017 long sleeve sheer black & burgundy velvet stripe dress which stopped just above her ankles. Constance belted the waist which I think worked her in favor. STELLA & DOT jewelry and VINCE CAMUTO sandals finished up her look. Laura Dern wore a black strapless VIVIENNE WESTWOOD layered lace embroidered gown with a corset top and a drape waist panel. Laura looks lovely in this gown but the hair & make-up doesn't complimented it. NIKOS KOULIS jewelry and LOUBOUTIN heels finished up her look. Kelly Marie Tran wore a custom THAI NUYGEN red strapless layered silk-chiffon gown with a draped train panel. Love the gown but she doesn't have the height for it. Sofia Vergara wore a semi see-through ROLAND MOURET black strapless tea length dress with a split neckline. There is nothing new or fresh about Sofia's look here because we have already seen her in something similar.